Purchased from the artist c. 1932 by Helena Rubinstein [1870-1965]; (her estate sale, Parke-Bernet, New York, 20 April 1966, no. 13); purchased by (Stephen Hahn Gallery, New York) for Mr. and Mrs. Taft B. Schreiber, Beverly Hills; gift in 1989 of Mrs. Schreiber to the National Gallery of Art. Possibly Salon des Tuileries, Palais des Bois, Paris, 1928, no. 390. Exposition Internationale de Sculpture Contemporaine, Musée Rodin, Paris, 1956, no. 44. Paris 09-29: Fastes et décors de la via parisienne de 1909 à 1929, Musée Galliéra, Paris, 1957, no. 42. Foire de Paris, Section "Prestige de l'art dans l'industrie," Paris, 1959. Brancusi: Photographs and Sculpture, The Phillips Collection, Washington, D.C., 1994, no cat. entry (exhibition shown at 6 venues prior to Washington). 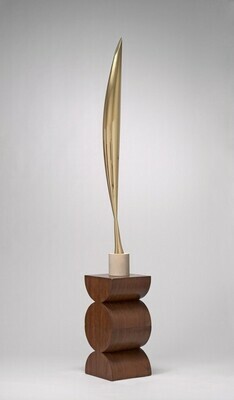 Constantin Brancusi 1876-1957, Musée national d'art moderne, Centre Georges Pompidou, Paris; Philadelphia Museum of Art, 1995, no. 92, repro. The Age of Modernism: Art in the Twentieth Century, Zeitgeist-Gesellschaft, Martin-Gropius-Bau, Berlin; Hayward Gallery, London; Solomon R. Guggenheim Museum, New York, 1997-1998, no. 154, repro. (shown only in Berlin). Huyghe, Rene. "L'Energie moteur de l'art du vingtième Siècle." Studies in the History of Art (1967-68):44-66. Sculpture: An Illustrated Catalogue. National Gallery of Art, Washington, 1994: 33, repro. Klein, Mason. Helena Rubinstein: Beauty is Power. Exh. cat. The Jewish Museum, New York; Boca Raton Museum of Art. New York, 2014: repro. 37, 143.